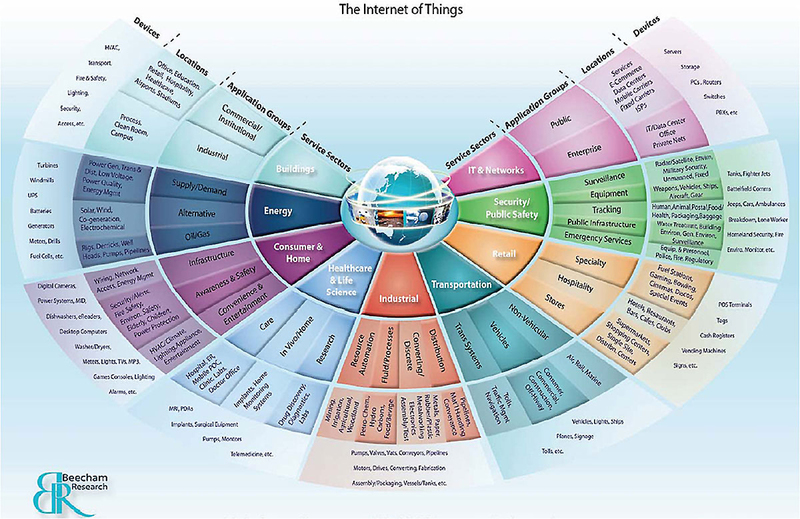 In researching and understanding the Internet of Things, so much depends on the definition. Not only does the space, such as it is, come with more than a dozen (synonymous?) monikers, but it looks wildly different from one industry to the next. Sometimes there is nothing more concise than a visual. Following you will find my curated list of what I believe are some of the industry’s best IoT frameworks. I define ‘best’ as most comprehensive across industries, use cases, infrastructures, and devices. Access the original graphic here. 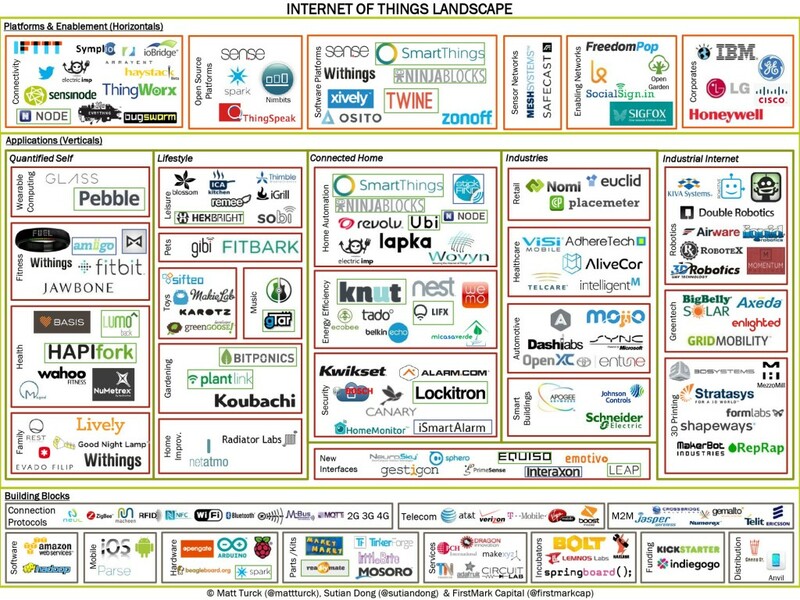 This is perhaps one of the best single-page maps of the IoT landscape to date, IMHO. What this map conveys successfully is both the breadth and complexity of the Internet of Things. What it does well is organize the practical and functional applications of IoT into several categories, which are distinct enough to understand at a high level. 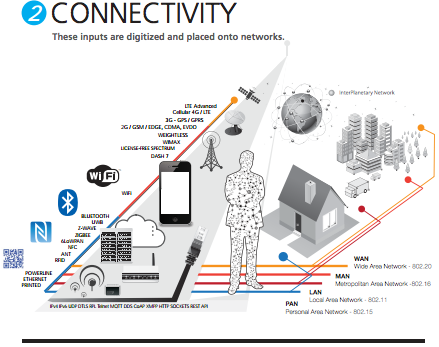 While IoT applications may not fit as cleanly into these categories as the map suggests, organizing its components into sectors, application groups, locations, and devices helps define the paradigm of a connected ‘everything.’ This map is also illustrative of how IoT blurs the lines between enterprise and consumer within the same ‘domain’ (e.g. Transportation). Yet, [the vision of] IoT is synonymous with the end of silo-ization (across departments, processes, even industries). Thus, where this map falters is showing how these domains might interact with eachother, how connection between these applications might look. The other piece excluded from this graphic is the ‘lifestyle’ side of IoT, including the longtail list of both common and more obscure consumer-facing IoT devices, from fitness trackers to smartwatches to smart cookingware to connect pet products and beyond. Although not a single-page map, the latest graphic from Postscapes and Harbor Research may be one of the best visual descriptions of the Internet of Things I have seen. 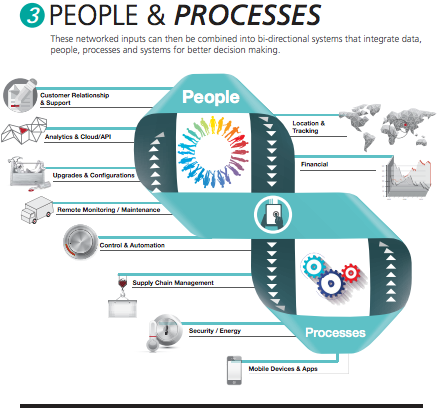 It is less a map, and more a framework or flowchart of how to think about IoT using three primary components: sensors, connectors, and people & process. (View the full infographic here.) The graphic is longer than shown above, going on to show examples of how these elements engage with eachother across domains and industries. 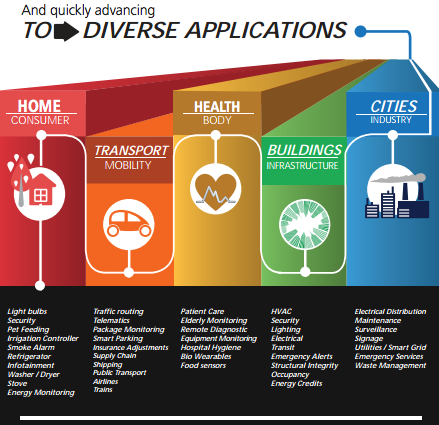 While I feel this graphic is the most instructive in terms of educating the reader on the building blocks of IoT (compared to the others listed in this post), it still falls short of being actionable or particularly insightful on when to apply these elements and how. It’s worth noting Harbor Research has another very thorough (if somewhat difficult to read) map of the ‘Pervasive Internet and Smart Services,’ found here. Although perhaps the least actionable of the bunch, the Lumascape still holds value. The value, however, is not in compiling a list of providers—the space is moving much too quickly and these vendors are being replaced, acquired, or dying out in very short cycles. Rather the value is in delineating the types of vendors in the market and how they play vertically or horizontally. It’s also an excellent round-up of the various elements (what they call ‘Building Blocks’) needed for seamless or interconnectivity across IoT; from mobile networks to connectivity protocols, to mobile software platforms, and beyond. This map, accessible here, is also insightful in that it shows the David vs. Goliath phenomenon taking place in the space; that is placing tiny start-ups like Knut against the likes of Google’s Nests, and the IBMs and Cisco’s of the world. Demanding a tidy map of IoT may well be a fool’s errand. The Internet of Things refers to a universal paradigm greater than any one application, device, industry, protocol, and even infrastructure. Furthermore, the IoT ecosystem is growing as we speak. One of the hallmarks of disruptive technology (especially early in the disruption curve) is that we struggle to define and understand what it is in the first place. As use cases, enterprise adoption, consumer preferences, and technological infrastructure continue to evolve, so too will the IoT and by extension, our understanding of where it is and what it is not. 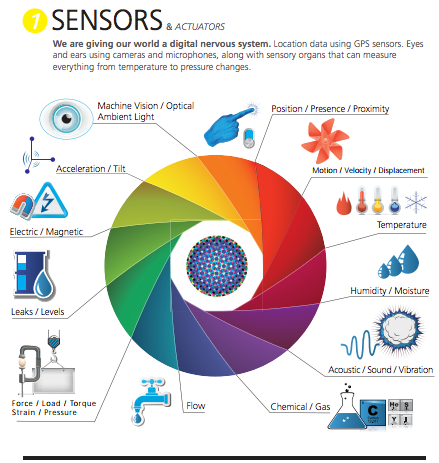 What we do know today is that the promise of IoT is that its sum far outweighs the parts. In short, the true value of IoT is not in the components that make up the fabric, but in the connections across the fabric itself and in the insights and efficiency gained from those connections. What are we missing? Help fill in the gaps by submitting other ecosystem frameworks. Despite continued evolution, there are insights to be gained by comparing and contrasting all ecosystem frameworks. Feel free to leave a comment or link in the comments, or you can email me directly at Jessica@altimetergroup.com and I will add your map with your requested attribution. You can also access a larger repository of frameworks I am collecting here. ← Will the Enterprise Pave the Way for Mass Wearable Adoption?